There has recently come into my possession a letter from the late Dr. Martin Luther King Jr that addresses the war in Afghanistan. It is miraculous, indeed, that the Martin Luther King should be writing a letter to you and to me more than 40 years after his death. How this is possible is something of an enigma wrapped in mystery. The important thing, however, is that we can imagine him writing a letter to Americans in 2010. Some may notice that the letter corresponds almost word for word to his famous 1967 speech against the Vietnam war. Perhaps this means Dr. King sees the issues as little changed since then. Yet clearly we must let Dr. King speak in his own words. Here is the letter as it stands before me. I write now because my conscience leaves me no other choice. “A time comes when silence is betrayal.” That time has come for us in relation to Afghanistan. Even when pressed by the demands of inner truth, men do not easily assume the task of opposing their government’s policy, especially in time of war. Nor does the human spirit move without great difficulty against all the apathy of conformist thought within one’s own bosom and in the surrounding world. Moreover when the issues at hand seem as perplexing as they often do in the case of this dreadful conflict we are always on the verge of being mesmerized by uncertainty; but we must move on. We must speak with all the humility that is appropriate to our limited vision, but we must speak. Perhaps a new spirit is rising among us. If it is, let us trace its movements and pray that our own inner being may be sensitive to its guidance, for we are deeply in need of a new way beyond the darkness that seems so close around us. As I have moved to break the betrayal of my own silences and to speak from the burnings of my own heart, as I have called for radical departures from the destruction of Afghanistan, many persons have questioned me about the wisdom of my path. 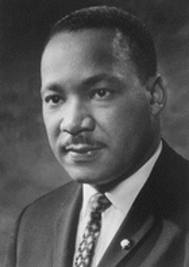 At the heart of their concerns this query has often loomed large and loud: Why are you speaking about the war, Dr. King? Peace and civil rights don’t mix, they say. And when I hear them, though I often understand the source of their concern, I am nevertheless greatly saddened, for such questions mean that the inquirers have not really known me, my commitment or my calling. Indeed, their questions suggest that they do not know the world in which they live. I now make a passionate plea to my beloved nation. It is not addressed to Kabul or to the Taliban. It is not addressed to Iran or to Pakistan. Nor is it an attempt to overlook the ambiguity of the total situation and the need for a collective solution to the tragedy of Afghanistan. Neither is it an attempt to make al Queda or the Taliban out to be paragons of virtue, nor to overlook the role they must play in the successful resolution of the problem. While they both may have justifiable reasons to be suspicious of the good faith of the United States, life and history give eloquent testimony to the fact that conflicts are never resolved without trustful give and take on both sides. Now, however, I wish not to speak to al Queda and the Taliban, but rather to my fellow Americans, who, with me, bear the greatest responsibility in ending a conflict that has exacted a heavy price on both continents. I have several reasons for bringing Afghanistan into the field of my moral vision. There is at the outset a very obvious and almost facile connection between the war in Afghanistan and the struggle I, and others, have been waging in America. A few years ago there was a shining moment in that struggle. It seemed as if there was a real promise of hope for the poor. There were experiments, hopes, new beginnings. Then came the wars in the Middle East, and I watched the programs broken and eviscerated as if they were some idle political playthings of a society gone mad on war, and I knew that America would never invest the necessary funds or energies in rehabilitation of its poor so long as adventures like Afghanistan continued to draw men and skills and money like some demonic destructive suction tube. So I was increasingly compelled to see the war as an enemy of the poor and to attack it as such. People asked me if our own nation wasn’t using massive doses of violence to solve its problems, to bring about the changes it wanted. Their questions hit home, and I knew that I could never again raise my voice against the violence of the oppressed in the ghettos without having first spoken clearly to the greatest purveyor of violence in the world today — my own government. For the sake of those boys, for the sake of this government, for the sake of hundreds of thousands trembling under our violence, I cannot be silent. Now, it should be incandescently clear that no one who has any concern for the integrity and life of America today can ignore the present war. If America’s soul becomes totally poisoned, part of the autopsy must read Afghanistan. It can never be saved so long as it destroys the deepest hopes of men the world over. So it is that those of us who are yet determined that America _will be_ are led down the path of protest and dissent, working for the health of our land. Another burden of responsibility was placed upon me in 1964; and I cannot forget that the Nobel Prize for Peace was also a commission — a commission to work harder than I had ever worked before for “the brotherhood of man.” This is a calling that takes me beyond national allegiances, but even if it were not present I would yet have to live with the meaning of my commitment to the ministry of Jesus Christ. To me the relationship of this ministry to the making of peace is so obvious that I sometimes marvel at those who ask me why I am speaking against the war. Could it be that they do not know that the good news was meant for all men — for Muslim and Christian, for their children and ours, for black and for white, for revolutionary and conservative? Have they forgotten that my ministry is in obedience to the one who loved his enemies so fully that he died for them? What then can I say to al Queda or to bin Laden as a faithful minister of this one? Can I threaten them with death or must I not share with them my life? And as I ponder the madness of Afghanistan and search within myself for ways to understand and respond in compassion, my mind goes constantly to the people of that region. I speak now not of the soldiers of each side, not of the government in Kabul, but simply of the people who have been living under the curse of war for three continuous decades now. I think of them too because it is clear to me that there will be no meaningful solution there until some attempt is made to know them and hear their broken cries. Our government felt then that the Afghan people were not “ready” for independence, and we again fell victim to the deadly Western arrogance that has poisoned the international atmosphere for so long. Now the Afghan people languish under our bombs and consider us — not their fellow Afghans — the real enemy. Perhaps the more difficult but no less necessary task is to speak for those who have been designated as our enemies. What of al Queda – and that strangely anonymous group we call the Taliban? How can they trust us when now we charge them with violence while we pour every new weapon of death into their land? Surely we must understand their feelings even if we do not condone their actions. They question our political goals. Their questions are frighteningly relevant. Is our nation planning to build on political myth again and then shore it up with the power of new violence? We are met by a deep but understandable mistrust. To speak for them is to explain this lack of confidence in Western words, and especially their distrust of American intentions now. Perhaps only his sense of humor and of irony can save bin Laden when he hears the most powerful nation of the world speaking of aggression as it drops bombs on a poor weak nation more than eight thousand miles away from its shores. At this point I should make it clear that while I have tried here so far to give a voice to the voiceless on Afghanistan and to understand the arguments of those who are called enemy, I am as deeply concerned about our troops there as anything else. For it occurs to me that what we are submitting them to in Afghanistan is not simply the brutalizing process that goes on in any war where armies face each other and seek to destroy. We are adding cynicism to the peril, for they must know after a short period there that none of the things we claim to be fighting for are really involved. Before long they must know that their government has sent them into a struggle amongst Afghans, and the more sophisticated surely realize that we are on the side of the wealthy and the secure while we create hell for the poor. Somehow this madness must cease. We must stop now. I speak as a child of God and brother to the suffering poor of Afghanistan. I speak for those whose land is being laid waste, whose homes are being destroyed, whose culture is being subverted. I speak for the poor of America who are paying the double price of smashed hopes at home and death and corruption in Afghanistan. I speak as a citizen of the world, for the world as it stands aghast at the path we have taken. I speak as one who loves America to the leaders of out own nation. The great initiative in this war is ours. The initiative to stop it must be ours. If we continue, there will be no doubt in my mind and in the mind of the world that we have no honorable intentions in Afghanistan. It will become clear that our minimal expectation is to occupy it as an American colony, and men will not refrain from thinking that our maximum hope is to goad Iran into a war so that we may bomb her nuclear installations. If we do not stop our war against the people of Afghanistan immediately the world will be left with no other alternative than to see this as some horribly clumsy and deadly game we have decided to play. The world now demands a maturity of America that we may not be able to achieve. It demands that we admit that we have been wrong from the beginning of our adventure in Afghanistan, that we have been detrimental to the life of the Afghan people. The situation is one in which we must be ready to turn sharply from our present ways. Take immediate steps to prevent other battlegrounds in the Middle East and elsewhere. Realistically accept the fact that the Taliban has substantial support in Afghanistan and must thereby play a role in any meaningful negotiations and in any future Afghan government. Set a date that we will remove all foreign troops from Afghanistan. Meanwhile we in the churches and synagogues have a continuing task while we urge our government to disengage itself from a disgraceful commitment. We must continue to raise our voices if our nation persists in its perverse ways in Afghanistan. We must be prepared to match actions with words by seeking out every creative method of protest possible. I say we must enter the struggle, but I wish to go on now to say something even more disturbing. The war in Afghanistan is but a symptom of a far deeper malady within the American spirit, and if we ignore this sobering reality we will find ourselves organizing clergy- and laymen-concerned committees for the next generation. They will be concerned about Iran and Pakistan. They will be concerned about Somalia and the Sudan. They will be concerned about Guatemala and Peru. We will be marching for these and a dozen other names and attending rallies without end unless there is a significant and profound change in American life and policy. Such thoughts take us beyond Afghanistan, but not beyond our calling as sons of the living God. I am convinced that if we are to get on the right side of the world revolution, we as a nation must undergo a radical revolution of values. We must rapidly begin the shift from a “thing-oriented” society to a “person-oriented” society. When machines and computers, profit motives and property rights are considered more important than people, the giant triplets of racism, extreme materialism, and militarism are incapable of being conquered. A true revolution of values will soon cause us to question the fairness and justice of many of our past and present policies. A true revolution of values will soon look uneasily on the glaring contrast of poverty and wealth. The Western arrogance of feeling that it has everything to teach others and nothing to learn from them is not just. A true revolution of values will lay hands on the world order and say of war: “This way of settling differences is not just.” A nation that continues year after year to spend more money on military defense than on programs of social uplift is approaching spiritual death. This kind of positive revolution of values is our best defense against Islamic extremism. War is not the answer. These are days which demand wise restraint and calm reasonableness. We must not call everyone an extremist or an appeaser who recognizes that hate and hysteria are not the final answers to the problem of these turbulent days. We must not engage in a negative anti-Muslim attitude, but rather in a positive thrust for democracy, realizing that our greatest defense against extremism is to take offensive action in behalf of justice. We must with positive action seek to remove those conditions of poverty, insecurity and injustice which are the fertile soil in which the seed of radicalism grows and develops. We are now faced with the fact that tomorrow is today. We are confronted with the fierce urgency of now. In this unfolding conundrum of life and history there is such a thing as being too late. Procrastination is still the thief of time. Life often leaves us standing bare, naked and dejected with a lost opportunity. The “tide in the affairs of men” does not remain at the flood; it ebbs. We may cry out desperately for time to pause in her passage, but time is deaf to every plea and rushes on. Over the bleached bones and jumbled residue of numerous civilizations are written the pathetic words: “Too late.” There is an invisible book of life that faithfully records our vigilance or our neglect. Omar Khayyam wrote: “The moving finger writes, and having writ moves on…” We still have a choice today; nonviolent coexistence or violent co-annihilation. We must move past indecision to action. We must find new ways to speak for peace in Afghanistan and justice throughout the developing world — a world that borders on our doors. If we do not act we shall surely be dragged down the long dark and shameful corridors of time reserved for those who possess power without compassion, might without morality, and strength without sight. Thank you for contacting me regarding the situation in Afghanistan. I support the President’s mission and exit strategy for Afghanistan, but I do not support adding more troops because there are now 200,000 American, NATO and Afghan forces fighting roughly 20,000 Taliban and less than 100 al Qaeda. Again, thank you for taking the time to share your thoughts on this important issue. Please feel free to contact me in the future about this or any other issue of concern to you.